If you listen to any news on the BBC then you are likely to have heard something about Crohn’s disease today.I didn’t really hear a lot, so was surprised to see my Twitter feed go a bit crazy about it all from fellow IBD (Inflamatory Bowel Disease) suffers. Today had been mildly hyped up by Crohn’s & Colitis UK as they were launching there new Fatigue in IBD microsite with tool to assess how your fatigue impacts on you. This followed a four year research project. The media and PR seemed to have been done well, and tied in with a story about the increase in hospital admissions for the under 30’s with the condition – quadrupling in the last decade. So so far, so good. The day started with an appearance on BBC Breakfast by the CEO of Crohn’s & Colitis UK and Rachel Flint, journalist and IBD sufferer – you can see the interview here. However, Radio 1 Newsbeat ran with an emphasis on the research suggesting that junk food is a cause of Crohn’s disease – their article is here. Apparently the sound bytes in later broadcasts on Breakfast also used Dr Sally Mitton‘s quote about junk food. There was even a segment on Jeremy Vine – and he led with the emphasis on junk food being mentioned, However, I thought Professor Chris Probert was good in debunking some of this if you listened carefully. I had a consultation with him once when I was first referred before he moved to Liverpool, so he has my personal seal of approval. Needless to say, many IBD suffers took to Twitter, YouTube and forums to vent there anger and frustration about this emphasis. And rightly so in my view. I quite like Thalia Skye’s video blog on the day. 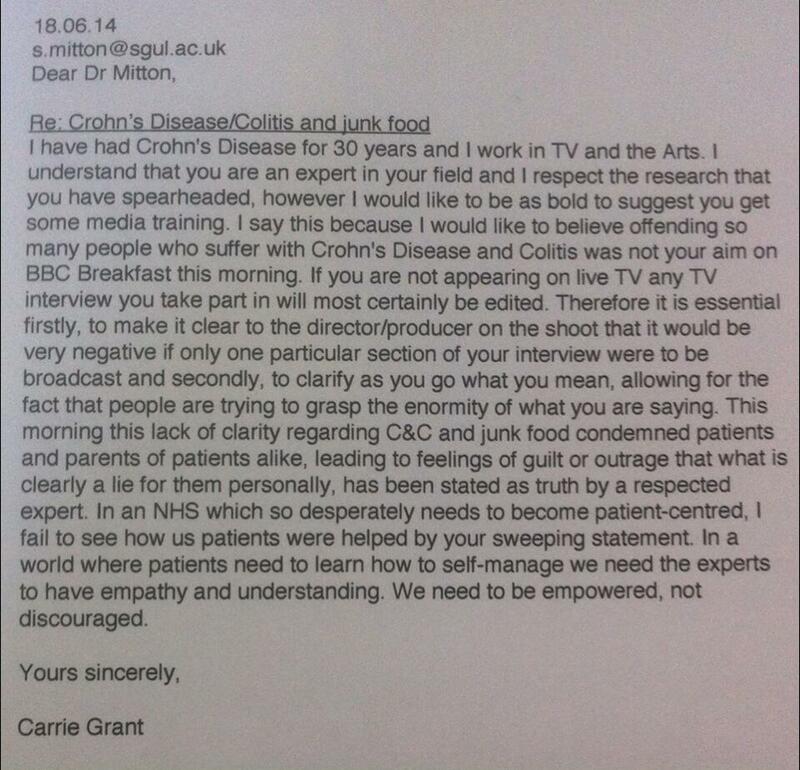 I also felt that Carrie Grant‘s analysis was very good in her letter to Dr Milton – posted here with permission. The good people at Crohn’s & Colitis UK also made a statement. So what can we learn from this? Well I have always been very open with my friends, families and colleagues about my disease (and I was originally diagnosed with Ulcerative Colitis) and what it means for me. So the fact that more information has come out is a good thing, even if the emphasis has been misleading. Now the IBD community needs to challenge the myths and spread real awareness. So friends and readers, if you have a question, please feel free to ask, or check out the Crohn’s Colitis UK website, and maybe consider making a donation – check the #getyourbellyout hashtag on social media for an easy way to donate. To the IBD community – lets use this as an opportunity – I don’t remember coverage like this ever previously. Challenge the myths. Celebrate our achievements, offer support to those whose condition is worse than our own. I’d never heard of Crohn’s or Ulcerative Colitis before my diagnosis – let’s see if we can change that.